I love me a good pompom craft all year long, but I may love them a little bit more at Christmas. 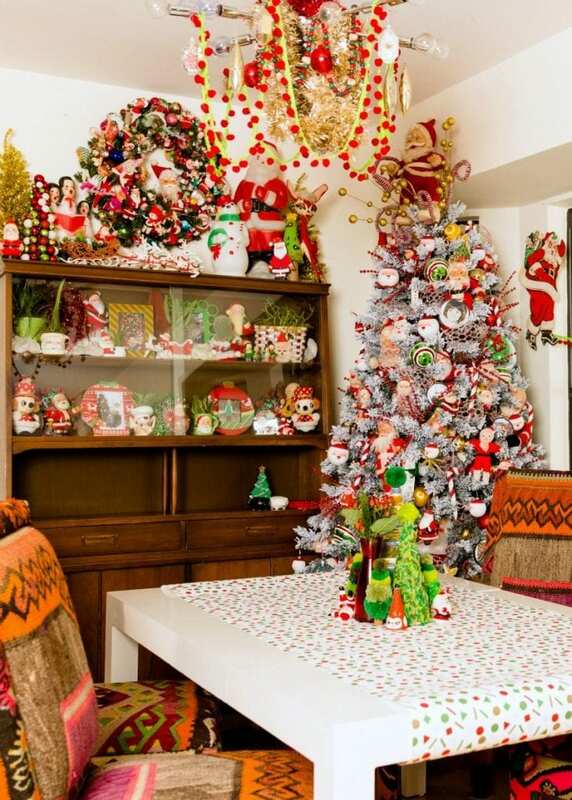 I’ve got pompoms on wreaths, garlands – I’m even making pompom Christmas trees. 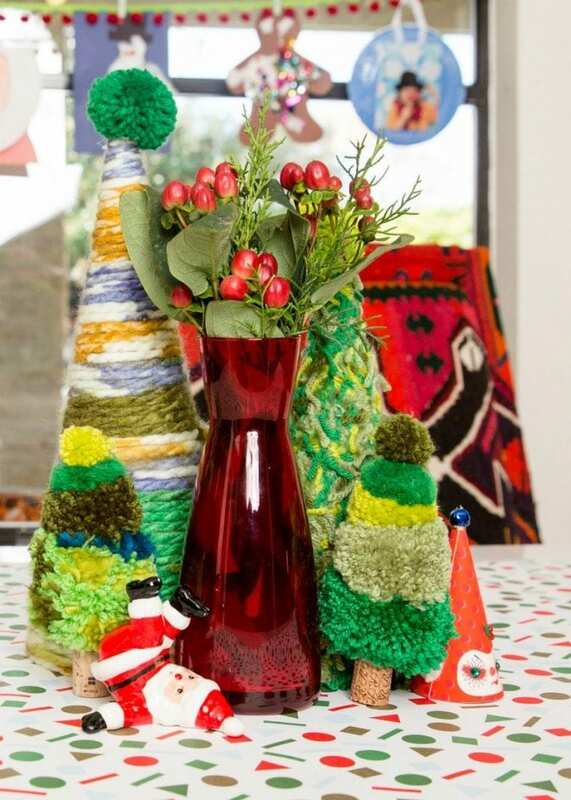 Wanna know how to make your own yarntastic Kitschmas forest? Ya, I thought so. 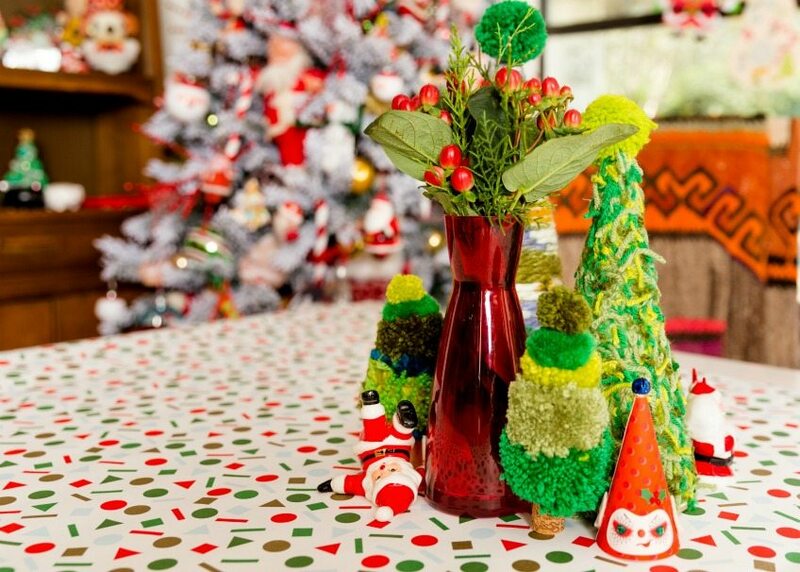 Stop over to DIY Network and check out my post called Wildly Technicolor Tabletop Christmas Trees. You can take a peeksie at some of the fun trees I’ve made this holiday season including fabric wrapped, folded magazines, tomato cages and you guessed it – yarn pompoms. Notice that there are actually 3 DIY trees. Check out this episode of DIY This With Jennifer Perkins to learn how to make them all. Oh and if you are not totally sure about how to make a yarn pompom check out this post: Adorable DIY Pompom Covered Pillows PLUS 8 Videos to Teach You How to Make Your Own. So what kind of yarn tree are you going to make this year? Yarn wrapped, yarn scrap or yarn pompom? Is there yet another option I’m not thinking of? Leave me a comment and let me know. Oh and what do you do with all your pompom scraps? Seriously, I’m always trying to think of things for them. Seems like such a waste to throw them out. There they are – my wee little yarn forest. They look pretty cute in front of my new Flocked Christmas Tree. See, not all my trees and decorations are neon pink and crazy. Well ok, most of them are but some are red and green. Now that I’ve typed that out loud I’m off to make a neon pink version of these yarn trees. Want more ideas for table-top trees? Keep reading! 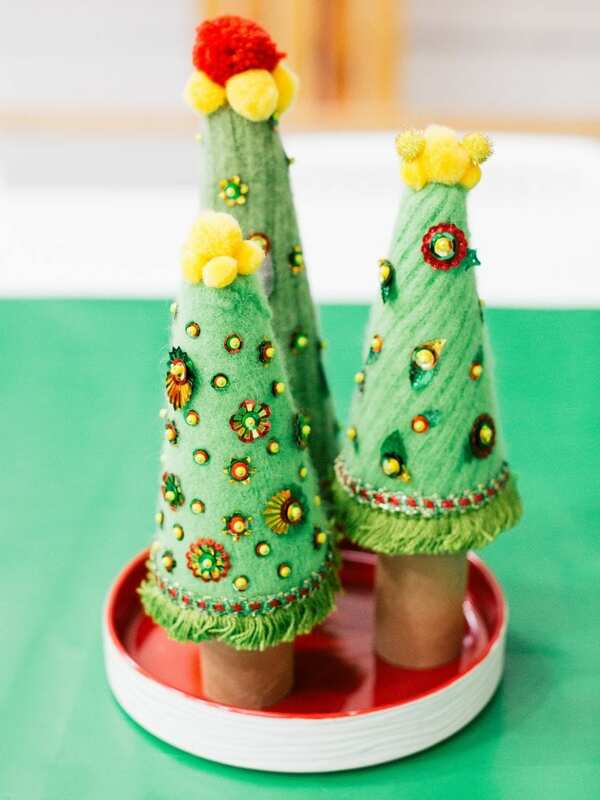 How To Make Sweater Christmas Tree Decorations – Take those thrift store sweaters and turn them into something fun like snuggly little Christmas trees. 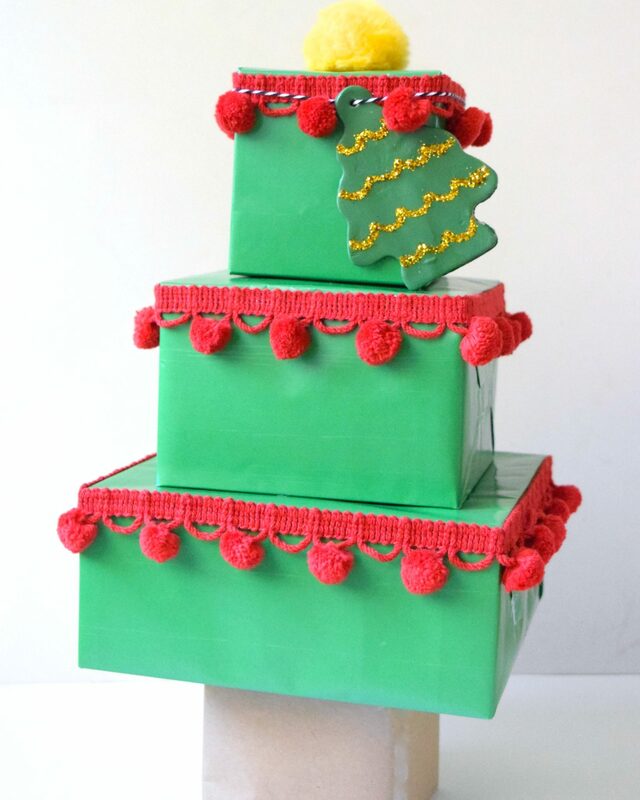 Tiered Tree Gift Box with Matching Clay Gift Tag – If you have a special gift for a special someone might I suggest this extra fun gift wrapping idea. 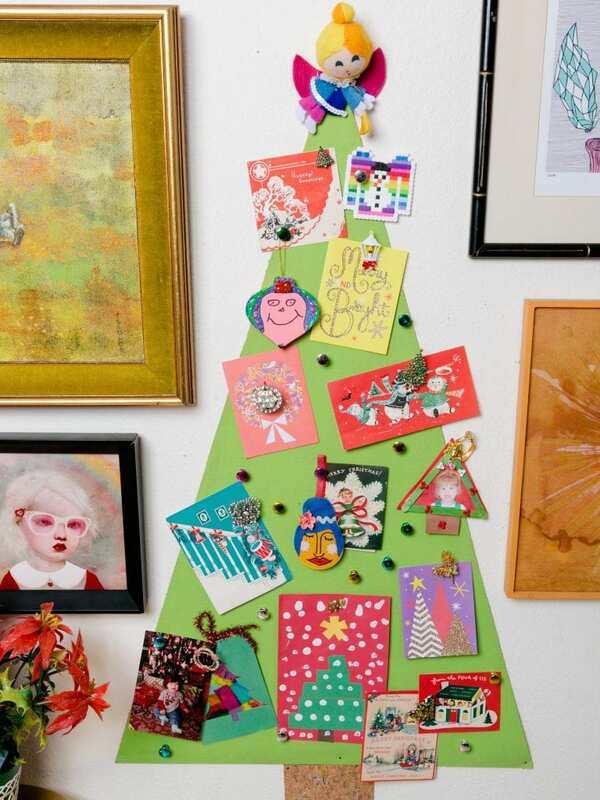 How to Make a Christmas Tree Corkboard to Display Holiday Cards – All those Christmas cards and kids crafts, but how to display them? I know! Make your own DIY cork tree. Posted December 8, 2017 & filed under Christmas, Holidays. I love your Pom Pom trees all the different shades of green look fabulous. Thanks so much. PLUS it is a great way to use up random bits of green yarn.